Located just outside of Phoenix, Harrah's Ak-Chin is an oasis in the beautiful Arizona desert. Our 300 luxurious guestrooms come complete with all the amenities to make your stay a comfortable one. The central garden showcases many varieties of cacti, and our lovely swimming pool and swim-up bar offer the relaxing ambiance of a first-class resort. 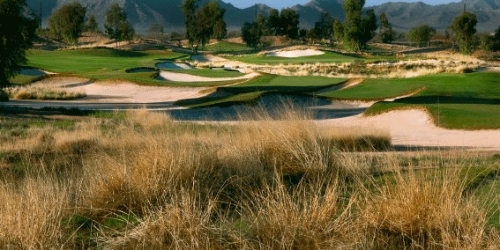 Ak-Chin Southern Dunes Golf Club reserves the right to change price and offer at anytime. Prices and offer are subject to change without notice. ArizonaGolfer.com is not responsible for errors posted in this golf package.